In 2015, Chris Grayling partially privatised our probation service, under the 'Transforming Rehabilitation' reforms. It's been a complete disaster. This week, Her Majesty's Inspectorate of Probation, Dame Glenys Stacey, published a scathing report criticising the privatisation of probation. Read our response in the Guardian here. This is the end of the line of privatisation of probation. Let's keep up the pressure on the Justice Minister and take back probation! Watch the video below to find out more, then sign the petition to Justice Minister David Gauke to bring the service back into public ownership. 35 publicly owned, self-governing regional probation services were split up and sold off. Now 21 privately owned 'Community Rehabilitation Companies' deal with the lower risk 70% of cases, and the National Probation Service deals with the higher risk 30%. 2017 - The private CRCs struggle to meet their targets, and the government renegotiates their contracts, and hands out more money. 2017 - The National Audit Office publishes a report showing CRCs had failed and had been rewarded for that failure with a better contract. July 2018 - Justice Minister David Gauke announces that the CRC contracts will come to an end two years early, in December 2020. 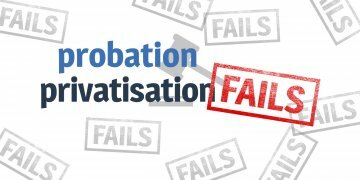 March 2019 - Her Majesty's Inspectorate of Probation publishes a report slamming the privatised probation service as 'irredeemably flawed' and calling for a national, joined up approach to fix the service. December 2020 - the CRC contracts are due to end early. Tell the Minister for Justice to bring probation in house before we get locked into another 5 years of privatised chaos! Tell us below why you want probation brought back into public ownership, and share this page with your friends. Nothing has ever been privatised and provided a BETTER service! Once profit is to be made, corners are cut, to “improve the service” (increase profits). The current probation service is not fit for purpose. Return it to PUBLIC OWNERSHIP! I was a probation officer from 1989 - 2009, the last few in management. The concept of a probation service began in London, and not so long ago we were sending staff worldwide to establish and promote good practice. Ha! If the arrogant incompetents "running" the country listened to those on the front line of any public service, and started taxing their super-rich mates, we might be able to turn things round. As if......sorry, I'm ranting, but I had the privilege of working with people for whom the ideals of compassion and public service were something taken for granted as part of the fabric of the job, and we still had space to try and do it properly. Try explaining all that to Grayling. I was a Probation Service Officer for almost 20 years in Wales. In 2013 after the decision to become partly privatised, I expressed concern that this would not be a viable solution to reduce offending. Removing face to face contact with offenders was a big mistake and this has now been proven. I left the job 2 years ago because of the bureaucratic way that the Crcs were heading and did not want to be part of the impending failure. The Probation Service have lost a vast amount of highly skilled and dedicated staff due to the ridiculous views of one man, Chris Grayling. One of the worst things about this privatisation is the way that the warnings of professional dedicated staff like yourself were completely ignored. Such a shame to waste so much valuable skill and talent, not to mention time and money, on a failed project. Chris Grayling did not fail; his remit was and is to further the application of Adam Smith's free market economic model. He brought about the privatisation of half of what was NPS. Thus he fulfilled his remit as a good little Neoliberal. Deregulation, privatisation and withdrawal of the (peoples?) government from many areas of social provision has been common. The USA manipulated Chile and El Salvador in a political experiment (- remember Pinochet?). In both cases Neoliberalism failed, horrendously. Reagan and Thatcher went on to use the toxic model regardless. Now the experiment has again failed, here, in Britain. It is evidently time to stop Neoliberalism and confine it to a few dusty tomes in the British library's room of shame. We must attend to the so called "creative destruction"(inherent element of neolibralism) and it's victims; the Probation Service, the NHS, the Prison service, public utilities, and heal the harm. It is imperative, however, that we all have an awareness of the people, groups and the Tories, concentrate on single issues and the guilty will side step them, every time. Let us invite the Neoliberals to take up their seats, in the Fletcher Memorial home for... ( Pink Floyd ). See it all, sort it.